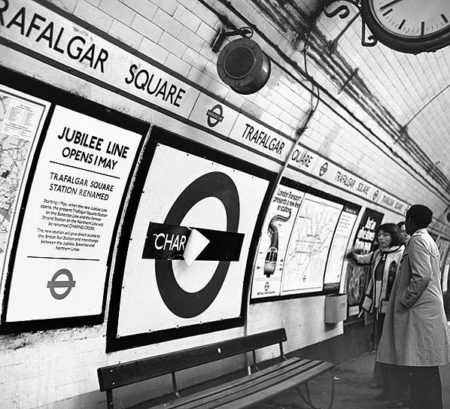 Yesterday I asked readers to work out why I had chosen Trafalgar Square & British Museum as my favourite tube stations. Interestingly, although there were hints of a correct answer nobody actually got it right. Both are now closed, and have now passed into London mythology. Trafalgar Square – which I can remember using – was closed with the construction of the Jubilee Line, which rendered it superfluous. It was incorporated into Charing Cross, but several of the side tunnels leading to the old ticket hall became the subway. One of them is a dead-end incorporating Davenports magic emporium, which has been going since the end of the 19th century and used to be opposite the British Museum. British Museum was also real, but closed in 1933 because there was another station, Holborn, less than a hundred yards from it. The station is reputed to be haunted by the ghost of the daughter of the Egyptian Pharaoh Amen-Ra. She would appear and scream so loudly that the noise would carry down the tunnels to adjoining Holborn. The station appears in Neil Gaiman’s ‘Neverwhere’ and in the 1972 movie ‘Deathline’ (see articles passim). For a full list (and photographs) of London’s lost underground stations, go here. Davenports nice one! But I dont think we stood a chance! I love Neverwhere, got the book, the new edition, the dvd, and the radio version. And Im not even a Gaiman fan! Agree about Neverwhere … terrific book. Thirded! Although I am a fairly committed Gaimanite. (Norse Mythology dramatisation on Radio 4 this Christmas). I started Neverwhere, but it disappeared. It must be in the bedroom somewhere (somewhen?) and I must look as I remember enjoying the start. I like ‘Down Street’ in Neverwhere – it literally leads Down. In the graphic novel of the book, it’s rendered utterly terrifying. I’ve always collected badges, or ‘pins’ as they are known elsewhere. My niece also collects them, and a few years ago, I got her a few bits and bobs that she wanted for Christmas (Sorry for dropping the ‘C’ bomb), and I found a site that had a fantastic collection of badges, with subjects I’d never seen on badges before – HP Lovecraft, Man Ray, various philosophers etc., – and every London Undeground station, including ‘British Museum’. I got my niece a nice assortment of badges, including a set of Nazca Geoglyphs, and ordered some LU badges for myself. I also said on my order email, that, seeing that they made a badge for ‘British Museum’ station, it might be nice to have some of the other ‘Ghost Stations’ represented, like Down Street, Brompton Road, York Road, Blake Hall, etc. My order duly arrived, containing three ziplock bags, containing the 20 or so I’d ordereed for my niece, the five LU stations for me, and a third bag… Which contained the ‘Ghost Station’ badges I had suggested. I hadn’t been charged for these, so I contacted them immediately to, of course, thank them profusely, and pay for the badges they had sent as extras. They told me not to worry about them, and were glad I was pleased with them. Now, here’s the thing: since that time, none of those badges have appeared on their catalogues, which says to me that that little set of dead stations was made just for me. In this day and age, that does my head in, frankly. By the way, the coat I wore to work today has the ‘Cockfosters’, which is the northern terminus of the Piccadilly line. And about ten minutes walk from my aunt and uncle’s house. D’oh! It should read’…badge on it’ immediately after ‘Cockfosters’. I assumed the “badge on it”,Ian. How often do we mentally insert phrases into communiques and how badly could that change the original meaning? -variant on a very old joke. Helen – That ‘Endeavour’ episode was possibly filmed at the old Aldwych station. I have seen pictures of the ticket hall re-fitted for a film or TV show. It was possibly the one you watched. The platform area is often used for filming, and did use to have an old LU train parked in one of it’s tunnels, so that it could be run into the station area if needed. This can be seen in the 2014 movie ‘Creep’, which can be seen as a companion piece to the 1972 horror movie ‘Death Line’, which was set at Russell Square Station. Aldwych has been used many times on film and TV. That would explain a lot, Ian. At one point we stood on the platform and looked out across empty land. “She could have screamed her head off and no one would’ve heard.” Indeed, and possibly why that line was closed? Not that I agree with closing lines, because there are always people who rely on the service and relocating them should be counted into the cost of closure. The Greyhound bus company has just closed its Western Canada service – nothing this side of the Great Lakes – and provincial governments are trying to ensure that places have service. It won’t be anything like before, though, and I don’t know how I would do the Lytton to Vancouver trip I did on holiday weekends when I first started teaching. The train doesn’t stop there any more, either. Aldwych was an odd station. It was virtually a dead end, and kept open really, for London’s theatregoers. The passenger numbers were erratic and low, and it operated only at peak hours. The crunch came when the lifts (elevators) had to be replaced, and the cost wasn’t worth the passenger numbers – London Underground lifts are bespoke, and interesting, by the way. Should one get stuck half way up, for instance, the second lift would be run up or down to sit alongside it. Special doors in each car can be opened by the lift operator in each lift, and passengers can step from one car to the other (a special flap covers the small gap), and get to safety. The lifts in Aldwych are fixed permanently ‘up’ in the shaft, nowadays, I believe. I have been on Down St platforms Ian. Think it was a Churchill hidey hole in WW2 can remember seeing a toilet and I seem to recall a bath down there they were absolutely filthy with tube muck and dust. Think the Electricity Board used it as some sort of underground facility in the years after WW2. It’s mentioned “Beneath the City Streets”. Together with a good mate of mine i travelled on the last train through Aldwych( which is an old Saxon term for old village the Saxons believing the Roman homes + buildings in the City to be haunted naffed off to live in the Aldwych believing it to be safer for their souls! ) I think the station closed in the early 1990s. Shut the same day as two tube stations right on the upper north Eastern Edge of the Central line closed. Can’t even remember their names there was a government nuclear bunker situated in the locality of one of these Essex stations. Been down there also – its now open to the public. No still can’t recall their names…..Bernie + myself went on to travel on the last central line journey immediately after riding the last Aldwych train. The last central line journey was ridiculously crowded like the height of a rush hour and there was a big party at the end of the journey. We were such saddos us two! Forgot to mention its used as a set for tons of films and adverts now is Aldwych. If you hang about round there you can see film crews and their kit going in and out during the week. Jan – you’re quite correct about Churchill. He preferred Down Street to ‘The Hole In The Ground’, as the Cabinet War Rooms were known. The now disabled lift in Down Street was put in for his use. Apparently, he really had to be persuaded hard to go undercover in air raids. A politician of the time recorded that Churchill was wont to stand in the garden of 10 Downing Street, and watch the raids. Churhill hated the bunker built at Dollis Hill, called ‘Paddock’, and went there only once, complaining that it was too far from the centre of London. The electricity site you mention, was actually in the old lift shafts of St.Paul’s Underground station. It was the main control for the National Grid. Perfectly safe from bombs, over 100 feet down – it was still in use several years after the war. It’s probably still there, in all probability. That’s what makes underground London so fascinating; the sheer amount of stuff that has just been left there. Most of the grey dust is flakes of human skin, mixed with the detritus from train brakes, etc. Nice. The Essex stations closed in 1994, Jan, were North Weald, and Ongar, which is the end of the Central line, and still the point from which distances on the LU are measured. Yes, there are (or were) scorpions at Ongar station – my cousin showed me them many years ago – my father’s family lived in Ongar. They’re all gone, now, sadly. In 2013, I went on a train from Ongar pulled by the old steam engine once used on the underground. The bunker you refer to, signposted with huge boards that point to the ‘Secret Nuclear Bunker’, is at Kelvedon Hatch.